Lugged Cable Ends are insulated to avoid Flashing / Sparking / Accidental Contacts. 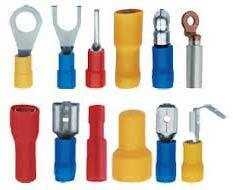 This is also necessary to Avoid Corrosion of Lugs and Cable Conductor Material. The Mechanical Bonding provided By âï¿½ï¿½Shrinkin'Sleeves" between Lug and Conductor sheath reduces the stress at the Terminal. Insulation is Traditionally Done By the Following Ways, Taping Painting / Spraying "Powder Coating" Epoxy Potting "Bare Bus Bar" Sleevings A) Imported B) "shrinkin'sleeves". Taping : in this Process Ordinary Electrical Insulation Tape is Used Which is Wrapped Around the Bus Bar from End to End. Desired Insulation is Achieved By No. of Layers Laid Over the Conductor. the Reliability of this Method is Very Poor. Painting / Spraying : Certain Paints are Available to Attain Electrical Insulation Up to a Low Value. Powder Coating : Uniformity Achieved is Uniform with Insulation Limitation Being the Main Constraint. Epoxy Potting : By this Method Insulation of High Value is Achieved in the Best Possible Way But It is Tedious, Costly and Time Consuming. Bare Bus Bar : Air Being Natural Insulator, Insulation Up to a Certain Low Value is Achieved By Adjusting the Distance Between Two Conductors. However Space Availability is the Constraint. Sleeving : By This, High Insulation Values are Achieved. Uniformity, Consistency & Reliability Levels Attained are of Very High Standards. Imported Sleeves : These are Rubberized Polymer Sleeves Having Excellent Insulation Properties. Availability and Very High Costs are the Major Factors Restricting Their Extensive Usage. Shrinkin Sleeves : Sleevings with Improved Electrical Insulation Properties Higher Insulation Values are Achieved By Encapsulating the Conductor in shrinkin'sleeves-Bb 100 Grade. Versatility, Reliability & Operational Simplicity, in Addition to Cost Effectiveness are the Major Favorable Factors. The Manufacturing Process Involves Orientation of Molecular Memory of the Sleeve Introducing a Built-in Shrinkage Which is Subsequently Released At Elevated Temperature Activating the Molecular Memory of Pvc Resulting in Instantaneous Release of the Shrink Strains. the Biaxial Strains Thus Released Result in Contraction of the Sleeve, Lengthwise and Width Wise. the Shrinkage Force Reaches Its Maximum During Cooling and is Maintained for a Longer Period Thereafter. Shrinkin Sleeves is Available in Creased Type Rolls with Roll Length Ranging from 50 Mtrs to 200 Mtrs. Wound Over Hard Card Board Core, Covered in Plyethylene Bag and Packed in Card Board Containers. Activation of Molecular Memory of the shrinkin'sleeves At Elevated Temperature Demands the Sleeves to Be Stored in Cool Place Away from Direct Sunlight, High Temperature and Humidity with Storage Tempt Not Exceeding 25oc. the Shelf Life of "shrinkin'sleeves" Prior to Shrinking, is 6 Months.